I like running; I do not like cycling. I can’t really see the attraction - gears to fathom, traffic to negotiate, and punctures to mend. I certainly don’t see the appeal of flying down hills at speed. In fact, the rare times I have gone cycling, I’ve come back with my hands in pain from gripping the brakes so hard, for fear of crashing. So for my Half Day Creative, I decided to get out of my comfort zone and tackle some of the Cheshire undulations with Rich Storer of Cheshire Cycling Training. As the day approached, I found more and more things to worry about - what if it was really icy, what if I fell off, or what if a car knocked me off…?? Tuesday came though and it was a beautiful day, crisp and cold with a bright, blue sky. My old bike had been dug out of the garage for the occasion. Determined to be warm enough, I’d borrowed quite a bit of my husband’s cycling gear so when Rich, the trainer, arrived I resembled a veritable Michelin woman. He immediately put me at ease, explaining the route and saying he’d be riding just behind me, so any vehicle would have to get round him before it got to me! And off we went. A little wobbly to start off with on my part but progress in a forwards direction was nonetheless made. We headed towards Broken Cross, down Pexhill and on to Redesmere (where there were plenty of ducks and swans but sadly not the customary ice cream van). Rich chatted non-stop the whole way (he gauges your level of fitness by whether you can reply or not) so there was absolutely no time to feel scared, even with cars and lorries trying to get past. After a brief photo stop, it was over to Siddington and around Marton, where there were definitely a few climbs. Rich pointed out the cycling legend, Reg Harris’ former residence (sightseeing included in the tour) and we then returned through Gawsworth without any mishaps. The only slight obstacle had been a tractor blocking the road, cutting branches and creating potential puncture hazards but this was safely negotiated. 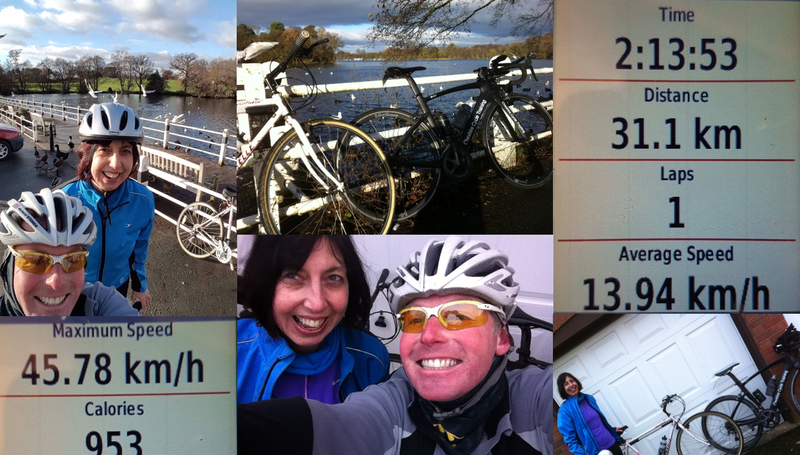 As for the vital statistics; we covered a distance of 31.1km, with an average speed of 13.94 km/h and highest speed of 45.78 km/h (I think that might have been Rich!). We ascended 297.0 metres and descended 327.0 metres, in a time of 2 hours 13 mins and 53 secs, not to mention burning 953 calories (pass the Mars bars). Rich was incredibly encouraging and reassuring throughout. He was also full of helpful tips about brakes, gears, cornering and the ‘chicken wing’ technique of keeping your arms relaxed. I’ve now got much more confidence in traffic and know what to look out for. All in all, it was a really fun afternoon out in the fresh air, in some beautiful countryside. So will I be taking up cycling? Well, I must admit I do like the fact you can cover a greater distance than on foot. I’m even quite tempted to get a decent bike... Who knows I may even give some of those fancy clippy shoes a go.